Iranian Foreign Minister Mohammad Javad Zarif says the Islamic Republic is do its best to help establish peace and stability in neighboring Afghanistan. 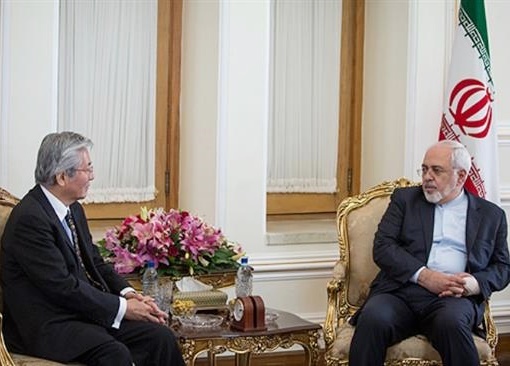 “Iran seeks stability in Afghanistan and our efforts are aimed to establish stability in this country,” Zarif said in a meeting with the special representative of the United Nations secretary general for Afghanistan, Tadamichi Yamamoto, in Tehran on Sunday. He added that Iran supports Afghanistan’s national unity government and the UN efforts to help promote peace in the war-ravaged country. The top Iranian diplomat also expressed the country’s readiness for close cooperation with the UN and its affiliated agencies in various areas in Afghanistan. The UN envoy, for his part, said Iran has taken constructive measures in Afghanistan and strongly supported the country’s national unity government. Yamamoto, who is also the head of the United Nations Assistance Mission in Afghanistan (UNAMA), called for the continuation of Iran’s positive role in establishing peace and stability in Afghanistan, while expressing regret over the worsening security situation in the country. Despite attempts by the Afghan government over the past one and a half years to promote peace in the country, the civilian death toll is still high in the country, he added. The UN estimates that at least 9.3 million Afghans – nearly a third of the population – will require humanitarian assistance in 2017, a 13-percent increase compared to last year, which comes amid growing violence, economic stagnation, and social upheaval in the country. Although the US military occupation of Afghanistan ousted the Taliban regime in 2001, it also deteriorated the security situation across the country, causing nearly daily violence and steady displacement of its people. Last year, however, saw record increases in the number of people displaced by the violence, with at least 626,000 additional people fleeing their homes, compared to nearly 70,000 in 2011, when the US-led military invasion was at its height.